One of our go to dishes is this quick and easy shortcut Chicken Parmesan recipe. We’ve found that using crushed croutons makes for the ultimate chicken parmesan recipe! We’ve tried breadcrumbs, seasoned bread crumbs, panko and seasoned panko and we always come back to our same secret for making quick and easy shortcut chicken parmesan recipe and I am pretty sure you’re going to love our way and be hooked forever. Crisp, golden brown chicken perfectly smothered in a light and flavorful marinara and mozzarella cheese that’s been cooked until gooey and delicious, now that’s dinner I want! 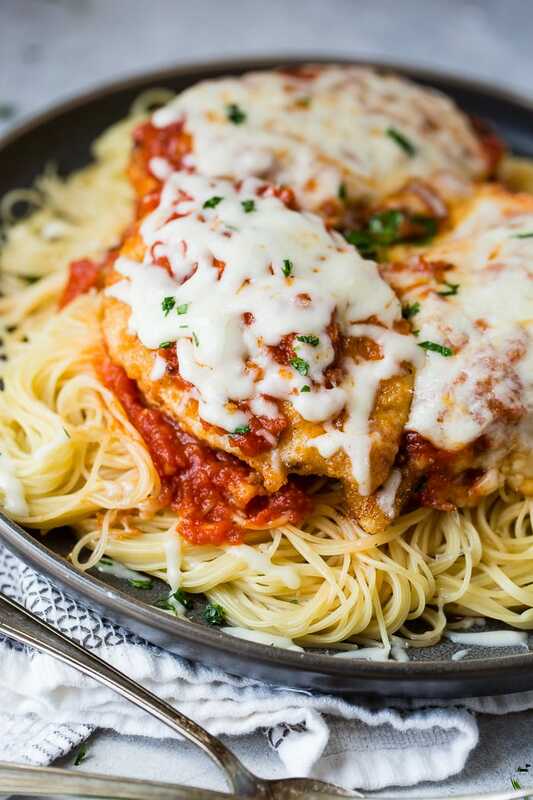 The post Quick and Easy Shortcut Chicken Parmesan Recipe appeared first on Oh Sweet Basil. Looks tasty. I love cheesy pasta recipes. There is a chicken parmesan recipe on healthy kitchen 101 that looks similar to yours. How coincident!